Bethel Bucks are a great way to support your local community. Scroll down to choose your denomination. Bethel Bucks are available in $5, $10, $20, or $50. What Can I Buy With Bethel Bucks? Bethel Bucks are easy to purchase, easy to redeem and can be used at a wide variety of businesses. Where Can I redeem Bethel Bucks? Bucks are redeemable at any Bethel Chamber of Commerce member business. Sorry, we cannot offer refunds on Bethel Bucks, nor can they be redeemed for cash at the Chamber or at participating businesses. How do Bethel Bucks work? Use them just like cash with any of our Chamber members! 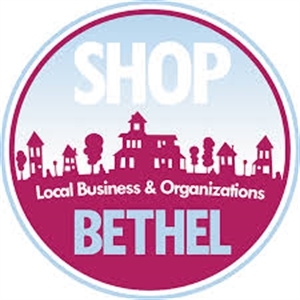 Bethel Bucks help support and promote business members of the Bethel Chamber of Commerce.